Bridgeview Marina and Resort: Offers a variety of slip sizes to meet any need and fuel on the water. Lake Texoma is one of the largest and most diverse freshwater lakes in the United States, and boasts a plethora of activities that will appeal to just about any outdoor enthusiast. With 89,000 acres of surface area, a depth of more than 600 ft. and more than 580 miles of shoreline, Lake Texoma is a magnet for power boat, sailing, scuba diving, wind surfing and water skiing enthusiast. Swimming and sunbathing are favorite lake activities, and Bridgeview Marina and Resort offers a sandy beach for guests to enjoy, but the fun doesn’t stop there. 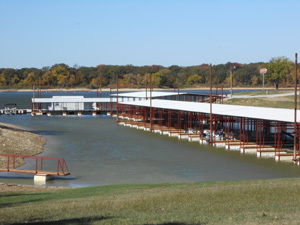 The marina rents a number of water toys, including pontoon boats, tubes and other equipment. And of course there is fishing. Anglers come from across the country to fish for the lake’s abundant blue and channel catfish, striped and black bass, smallmouth and largemouth bass, bluegill and crappie. Whether your preference ranges from rod & reel, fly or bow fishing, Lake Texoma offers plenty of opportunities to land that prize specimen. Lake Texoma is a Corps of Engineers’ lake, so private citizens can’t own property down to the water’s edge. With gasoline edging toward $4 per gallon, towing your boat to the lake and finding a public boat ramp can be inconvenient, expensive and challenging. That’s where Bridgeview Marina and Resort comes in. Your boat is a major investment, and for many of our guests boating is much more than just a hobby - it’s a way of life. To help protect that investment, Bridgeview offers covered boat slips equipped with the HydroHoist lift system, to gently raise and store your boat or personal watercraft out of the water. Bridgeview Marina and Resort offers a variety of slip sizes to meet any need. 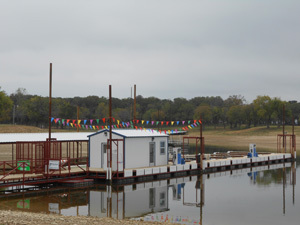 Some guests elect to rent a larger slip with a patio, to create even more value for their time at the lake. Bridgeview Marina and Resort are happy to assist you with your fuel needs on the water. If you require gas on the water, call us from the Roosevelt Bridge at (580) 795-3979, and we will meet you at the gas dock.